Bagikan informasi tentang LINCOLN STICK ELECTRODES SMAW – AWS E7016 kepada teman atau kerabat Anda. Easyarc 6013 can be used for the welding of mild steel. Aspecially suitable for sheer metal welding,tack welding and other types of welding which require a smoot and clean bead appearance. 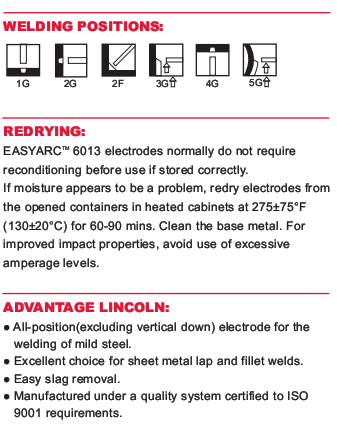 Easyarc 6013 is an all position (excluding vertical down),rutile electrode for mild steel.It weld on AC or DC with excellent performance and easy restrike features,.